Profile: Highbrow considers warfare a barbaric solution to problems, worthy of only the most primitive sentient creatures. He believes civilized folk should talk about their differences, a talent for which he seemingly has an endless capacity. Hardhead claims that Highbrow's voice box burns enough fuel by itself to power all the Nebulan Autobots for a year. Although that is doubtful, Highbrow does talk a lot and uses a lot of words that nobody understands. Even Chromedome often finds himself fruitlessly searching through his extensive vocabulary. Highbrow considers himself intellectually superior to the Nebulans and other Autobots. They think he's a self-righteous snob. Highbrow's biggest disappointment in life is that circumstance has forced him to lower himself to participate in the very activity he most loathes - fighting. Gort, Highbrow's Nebulan partner, is quite a contrast. He's a cheerful young man with never an unkind word for anyone. Spurred by concern for protecting his planet, he overcame his working-class origins as a stable boy for an exclusive Nebulan country club that catered to the aristocracy to join the elite ranks of the Headmasters. He is much admired by his comrades for his earnestness, common sense and courage - except for Highbrow, who finds it a humiliating, humbling experience to be binary-bonded to such a commoner. Young women all over Nebulos are attracted to the boyishly handsome hero, but Gort remains steadfastly faithful to his long-time girlfriend, Marita. Gort is the All-American boy of the Nebulan Autobot Headmasters. 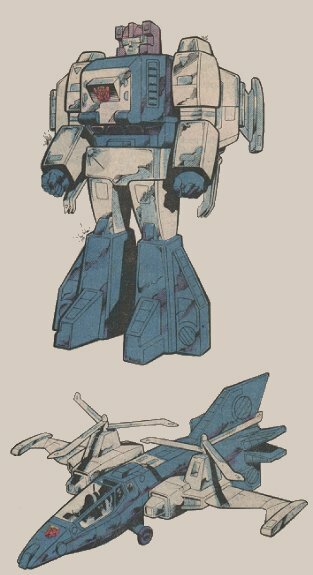 Abilities: In helicopter mode, Highbrow has twin three-bladed rotors that enable him to lift up to 22,000 pounds of cargo, and, with the help of two small vectored-thrust turbofan engines, reach a maximum speed of 1200 mph. More accurately, Highbrow's designation is a jet helicopter. He's packed with equipment designed to detect, monitor and record enemy communications; target-indicating radar whose signals can be relayed to ground stations; magnetic, infrared and audio sensors for detecting enemy robots and vehicles; and a variety of anti-detection systems to protect himself. His range is 800 miles. In robot mode, Highbrow uses two acid rainmaker rifles, which shoot streams of highly corrosive acid. Weaknesses: Sometimes the thrust of Highbrow's jet engines overpower his rotors, sending him spinning out of control when in helicopter mode. Also, Highbrow's deep resentment of being controlled by Gort makes him less than cooperative at times.